SAN BERNARDINO, Calif. — The Mogharebi Group (TMG) has arranged the sale of Bernardine Senior Independent Living, a 71-unit community in San Bernardino, approximately 60 miles east of Los Angeles. Built in 1984, Bernadine Senior Independent Living is a four-story, 71-unit apartment community totaling 36,210 rentable square feet and situated on a one-acre site. A private investor out of Los Angeles acquired the property for $6.8 million, or $95,423 per unit. The seller was an Inland Empire acquisition group. Alex Mogharebi, Otto Ozen and Bryan LaBar of TMG represented both the seller and buyer in the deal. RIVERSIDE, CA—The Mogharebi Group, (“TMG”) has completed the sale of The Groves Townhouse Apartments, a 32-unit community that is located on Magnolia Avenue in Riverside, CA. The property sold with multiple offers for a sales price of $5.9 million or $184,375 per unit. The buyer was a Riverside based private investor. Alex Mogharebi and Otto Ozen of TMG represented the seller, a private investor based in Orange County, and the Riverside based buyer. Built in 1984, The Groves Apartments is a two story, 32-unit apartment community that is located on Magnolia Avenue in Riverside, CA. The property comprises 8 fourplexes totaling 33,280 rentable square feet. The complex is situated on a 1.68-acre site. The Groves features all spacious two-bedroom / 1.5-bath townhomes with a large average size of 1,040 square feet. The property boasts a swimming pool & jacuzzi, 8 laundry rooms (one per fourplex), orange grove, and private garage parking. With unrivaled local knowledge, an extensive global network of top real estate investors, state of the art technology, and direct access to capital, The Mogharebi Group is the best choice to meet the needs of major private investors and investment funds. The Mogharebi Group (“TMG”) has completed the sale of Paradise Apartments in Chico, a 164-unit community, located on West Sacramento Avenue. The property sold with multiple offers for $18,200,000 that equates to $110,976 per unit or $143 per square foot. The buyer was a private investment group out of Calabasas, Calif.
Otto Ozen, Alex Mogharebi, and Bryan LaBar of TMG represented the seller, a Los Angeles based investment group, and the Los Angeles based buyer. Built in 1974-1988, Paradise Apartments, a two-story, 164-unit apartment community, comprises 34 residential buildings totaling 127,572 rentable square feet and situated on a 15.1-acre site. Paradise Apartments features one, two, three, and four-bedroom units. The community also boasts three sparkling swimming pools, clubhouse with pool tables and couches, four laundry facilities, fitness center, covered parking, and a leasing office with mail center. The Mogharebi Group, (“TMG”) has completed the sale of Canyon Springs, a 138-unit community that is located on North Figarden Drive in Fresno, CA. The property sold with multiple offers for a sales price of $19 million that equates to $137,681 per unit. The buyer was a private investment group based in San Diego. Canyon Spring Apartments is a community that is partially affordable housing with restrictions from both tax credits and bond covenants. Alex Mogharebi, Otto Ozen, Robin Kane, and Brendan Kane of TMG represented the seller, a Clovis-based private investment group, and the San Diego based buyer. Built in 2004, Canyon Springs Apartments is a two-story, 138-unit apartment community, located on North Figarden Drive in Fresno, CA. The property comprises 14 residential buildings. The complex is situated on a 14.77-acre site. The apartment homes feature spacious two-, three-, and four-bedroom floor plans with an average size of 1,058 square feet. The property boasts a swimming pool and spa, a clubhouse, a tot lot, a business center, a fitness center, a basketball court, a volleyball court, and covered parking. The units are replete with wood laminate or vinyl flooring in the kitchen and bath areas, plush carpeting in the bedroom and living areas, washer/dryers in every unit, and balconies / covered patios. With unrivaled local knowledge, an extensive global network of top real estate investors, state-of-the-art technology, and direct access to capital, The Mogharebi Group is the best choice to meet the needs of major private investors and investment funds. The Mogharebi Group (“TMG”) has completed the sale of Villa Plaza in Ontario, a 66-unit community, located on West 4 [th] Street. The property sold with multiple offers for $9,360,000 that equates to $141,818 per unit or $268 per square foot. The buyer was a private investment group out of the San Gabriel Valley. Bryan LaBar, Otto Ozen, and Alex Mogharebi of TMG represented both the seller, a San Diego based private investor and the San Gabriel Valley buyer. Built in 1970, Villa Plaza is a two story, 66-unit apartment community comprises 6 residential buildings totaling 34,975 rentable square feet and situated on a 1.20-acre site. Villa Plaza features one and two-bedroom units. The community also boasts a clubhouse with full kitchen, laundry facilities, covered parking, and controlled access. An East Coast firm has purchased a ground lease from The Bascom Group for the 138-unit Citrus Court community in Whittier. A source familiar with the matter told The Real Deal that an undisclosed buyer purchased the lease for around $28 million. The sale closed earlier this month. Irvine-based Bascom Group acquired the lease at 8121 Broadway Avenue for $13.4 million in 2014, according to a press release from The Mogharebi Group (TMG), which represented both parties in the transaction. The real estate website Multi-Housing News first reported the deal. The property is on a ground lease through 2064, which means the land and property are owned by different entities. Ground leases give the lessee the right to build or redevelop property, or collect rents. Otto Ozen, executive vice president at Costa Mesa-based TMG, said Bascom started improving Citrus Court with new amenities, and the new buyer plans to finish the renovations. The multi-family community was built in 1967 and spans five acres. Units rent from $1,350-$2,020, and the complex features two pools, a pet park, a fitness center, and a business center. Ozen pointed to Whittier’s education system and its improving retail mix as reasons to invest in the 15-square-mile city that’s southeast of Downtown Los Angeles near Pico Rivera. Earlier this year, Bascom Group sold an 89-unit condominium complex in San Pedro for $36.3 million. Over the past few years, a lot of focus on the Valley’s housing market has centered on the growth of home prices since the Great Recession. Over that time, rental rates on apartments, duplexes and single-family homes also have steadily risen. But figuring out how much those rents have gone up depends on whom you ask. While the price to buy a home in Fresno County has averaged increases of about 9 percent over each of the last seven years — with a slight slowdown this year — rental website Apartment.com puts the increase in rental prices at 4.2 percent for all sizes of apartments in Fresno County this year compared to last year, and at 21 percent over the past five years. The website also puts the five-year increase in rental rates for Tulare, Madera and Kings counties’ apartments at between 14 and 19 percent, based on prices asked for by apartment owners and property managers, though non-apartment rentals aren’t included in the estimates. Meanwhile, another website focused on rentals, Zillow.com, factors all residences — apartments, single family, etc. — and calculates what their rental prices would be and estimates the average rental price increase in all four counties from October 2010 to October of this year at just over 4.5 percent, with Fresno County alone averaging more than a 12.5-percent increase. Then there’s ApartmentList.com, which looking only at listed apartment rental prices, reports that in Fresno rental prices from November of last year to November of this year saw rents increase 17 percent in just that one year, on average, exceeding the state average of 14 percent over the same period and the national average of 13 percent. Whatever the percentage, the rise in rental rates is “robust” in Fresno, Kings, Madera and Tulare counties, said Doug Ressler, director of business intelligence for Yardi Matrix Café, which, among other things, provides market research on trends for apartment buildings and complexes with 50 or more units. In the counties combined, he said, average rents have increased 3.1 percent from the first quarter of 2017 to last month. “Some larger metropolitan areas are not averaging that [rate]. We’re starting to see a dampening in some areas, but 3.1 percent is very aggressive and very strong,” he said. Not that there’s much chance of the Valley rental rates exceeding those of most large California cities any time soon. San Francisco and San Jose as having the highest average apartment rental rates, $3,100 and $2,650 a month, respectively. Those high rental rates, as well as those in other part of the Bay Area, coastal areas and Southern California, are part of what’s driving up rental prices here, the experts say. Here in the Valley, job growth has been dramatic since the recession. “We’ve been on a tear, and over the last two years, job growth has been tremendous,” said Robin Kane, a senior vice president overseeing the Fresno and Bakersfield offices of the Mogharebi Group, a commercial real estate firm specializing in brokering sales of large apartment buildings and complexes. He said the supply of rental units and jobs are the two primary factors affecting demand for rental units, and on the supply side, construction of new rental housing has been “meager” compared to demand here, which has helped rental rates grow. As for jobs, the higher employment rates here are pushing up rental demand, as is the growing number of people leaving Southern California and the Bay Area for the Valley — along with parts of Nevada, Arizona and Idaho — where it’s cheaper to live, elevating demand for apartments and homes to purchase, Kane said. “This [area] would be the last refuge of Californians,” who want to stay in the state, he added. With all of this going on, it’s a good time to own or build residential rental properties, if you know what you’re doing. “Right now, in terms of the rental market for apartments 50 units and up, in order to make it pencil out, you have to build the type As,” higher-end or luxury apartments for tenants who can afford much higher rents, he explained. When building for working-class tenants who can’t afford those rents, “You need stipends or subsidies in order to turn profits,” Ressler said. “And there’s not a wealth of programs to do that,” for market-rate rental developments, as opposed to affordable housing that have a systems for funding and tax breaks to promote such developments, he said. Southern California and Boston, are working around that by including “micro units” in their new apartment buildings to qualify for some affordable housing assistance. Unlike standard apartments, micro units are bedrooms rented by individual tenants or couples who share common living rooms and kitchen areas with the other renters, Ressler said. While residential rents in the Valley likely haven’t gone up as much as home purchase prices, renters generally are feeling the effects more than homeowners, as renters tend to have less discretionary income. That could become a problem for apartment owners, said Kane, explaining that “You get to the point in time where you’re raising the rents above the ability of the market to increase salaries, to increase household income, so you start thinning out the numbers, so demand is diminished, not because they don’t want it,” but because people can’t afford to relocate or improve their living conditions, he said. “The impact is not so much on the top end of the market but on the lower end of the market. Because those are the people able to least handle rent increases,” and those tenants already are experiencing the most dramatic increases in the Valley, Kane said. 45-unit community in Cathedral City, for $7 mil, or $155.6k/unit. It was sold by a family partnership located in Cathedral City. Built in 1987 and recently remodeled, Presidio Park is a two-story property located on Gerald Cord Drive. The complex comprises four residential buildings totaling 45.3k sf on just over three acres. The property boasts a swimming pool, tennis court, outdoor picnic area with BBQs, laundry facilities, and covered parking. Otto Ozen and Mike Marcu with The Mogharebi Group represented both parties in the transaction. Twin Palms Apartments an 83-unit multifamily community in Pomona, CA, has traded hands for $10.4 million. The buyer was an unnamed private Manhattan Beach, CA-based investment group. Built in 1964, Twin Palms is a two-story apartment asset comprising two residential buildings totaling 30,860 rentable square feet and situated on a 1.41-acre site. The property at 1512-1514 W. Mission Blvd. features studios and one-bedroom units, and also boasts two swimming pools, an outdoor picnic area with BBQs, covered parking, and controlled access. The Mogharebi Group’s Otto Ozen and Alex Mogharebi represented the undisclosed seller, a San Gabriel Valley-based investment group, as well as the buyer. How hot is the Manteca apartment market? The 91-unit Union North apartment complex on North Union Road has been sold for a record $17.2 million. Manteca now has apartments renting for more than $2,000 a month. Paseo Villas on Atherton Drive has two floorplans renting for as high as $2,015. They are the three bedrooms, two bathroom plan with 1,292 square feet and a two bedroom, two bathroom plan with 1,217 square feet. The smallest apartment among the complexes in Manteca built after 1970 is renting for $1,055. That’s a 460-square-foot studio apartment in Westwood Village on West Center Street. Next door in the Stonegate Apartment complex the smallest one bedroom, one bathroom apartment in the post-1970 offerings in Manteca with 538 square feet is commanding $1,265 a month. The sale of Union North that was built in two phases — the first in 1974 and the second in 1979 — set a record price per square foot for an existing apartment complex in the Manteca-Lathrop-Ripon area. That translates into $229 per square foot or $186,957 per unit. To put that in perspective the 164-unit Tesoro Apartments at Atherton Drive and Van Ryn Avenue now under construction is costing more than $30 million, or just over $190,000 per unit. The Tesoro complex targeted for a mid-2019 completion is being built as a luxury apartment complex in the same category of the 293-unit Paseo Villas to the west across Van Ryn Avenue. Otto Ozen, Robin Kane and Brendan Kane of TMG represented the seller, a real estate acquisition firm located in the Bay Area and the Clovis based buyer. Plans are now moving forward for the city’s largest ever apartment complex consisting of 400 units immediately east of Bass Pro Shops on land sandwiched between the 120 Bypass and Atherton Drive. Union North is a one and two story, 91-unit apartment community comprised of 23 residential buildings totaling 74,319 rentable square feet and situated on a 6.55-acre site. Union North features spacious two- and three-bedroom townhomes with an average size of 817 square feet. Each unit features a washer/dryer, large private patio, and an attached parking garage. The community also boasts a swimming pool and relaxing spa, outdoor picnic area with BBQs, and controlled access. The Union North complex’s website currently lists several two bedroom, two bathroom units with 1,655 square feet available for $1,655 to $1,680 a month. THE MOGHAREBI GROUP has been retained as the exclusive listing agent for a portfolio that is composed of 3 Class A quality properties totaling 360 units in Visalia. Each of the properties features similar floor plans and construction. The properties were built from 2007 to 2008. They are located within 2 miles of each other, providing good operational scale. THE MOGHAREBI GROUP has been retained as the exclusive listing agent for the largest privately owned multifamily portfolio that has been available in the UC Santa Barbara market in years. 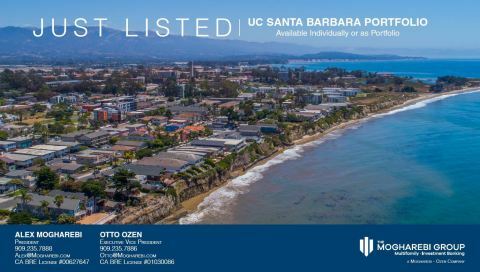 The portfolio comprises 10 individual properties totaling 100 units in the coastal community of Isla Vista, that is the residential location of choice for UC Santa Barbara students. THE MOGHAREBI GROUP has been retained as the exclusive listing agent for one of the largest privately-owned multi-family portfolios in Southern California. 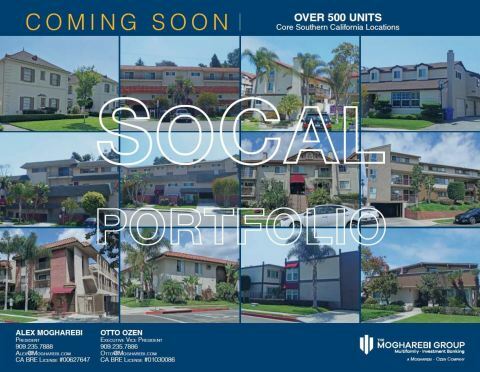 The portfolio spans across the South Bay and Glendale regions of Southern California with 27 individual properties totaling over 500 units making it one of the largest portfolios of its kind in California. Many of the properties are on the market for the first time in over a decade. The properties are well positioned and located in several high demand areas of Southern California including: Redondo Beach, Hermosa Beach, Lomita, Carson, and Glendale. The Mogharebi Group (“TMG”) has completed the sale of Coaling Station B, a 105-unit community that is located on Truman Street in Coalinga, CA. The property sold with multiple offers for a sales price of $7.9 million. The buyer was a private investment group based in the Bay Area. Otto Ozen and Nazli Santana of TMG represented the seller, a Northern California based private investor and the Bay Area-based buyer. Built on a 7.0-acre site in 1987, Coaling Station B is located at 250 Truman Street in Coalinga. It is located adjacent to Highway 33, which is a 10-mile drive to Interstate 5. Interstate 5 connects Coalinga to the rest of the Central Valley. Coaling Station B is adjacent to West Hills College Coalinga, which is a public two-year community college providing higher education and sports facilities to area residents. Coaling Station B features community amenities including a tennis court, basketball court, swimming pool, clubhouse, outdoor picnic area with barbeque, laundry facilities, garages, covered parking, and a rental office. The property offers 8 one-bedroom, 70 two-bedroom one-bath, 18 two-bedroom two-bath, 8 three-bedroom two-bath, and 1 four-bedroom two-bath units with an average unit size of 855 square feet. There are approximately 8 units that are newer, which feature washer/dryers, garage parking, and granite countertops. Costa Mesa, CA – Costar, the largest organization serving commercial real estate, has awarded The Mogharebi Group with the 2017 CoStar Power Broker Award for the Orange County (SoCal) and Central Valley Markets. The award recognizes the most active firms and individual dealmakers in the United States each year. This years’ award winners include Founder Alex Mogharebi for the Orange County market, Otto Ozen, Executive Vice President, for the Orange County market and Robin Kane, Senior Vice President, for the Central Valley market. “It is both an honor and a pleasure to have been selected by CoStar as the leaders in the Orange County and Central California regions. We could not have achieved this success without the partnership of our loyal and dedicated clientele,” says founder and President, Alex Mogharebi. The Mogharebi Group, (“TMG”) has completed the sale of Casa Del Sol Apartments, a 205-unit community that is located on Freemont Street in Bakersfield, CA. The property sold with multiple offers for a sales price of $12.225 million. The buyer was a private investment group based in the San Fernando Valley. Alex Mogharebi, Otto Ozen, Robin Kane, and Mark Bonas of TMG represented the seller, a San Diego-based private investment group, and the San Fernando Valley-based buyer. Built on a 7.15-acre site in 1965, the Casa Del Sol is located at 2601 Fremont Street in Bakersfield. It is located near State Highways 99 and 58, providing convenient access to all areas of Bakersfield, as well as the Central Valley and the state. Casa Del Sol is approximately six miles southeast of California State University, Bakersfield. Casa Del Sol Apartments features community amenities including a swimming pool, gated/controlled access, intercom entry system, security cameras, 24-hour maintenance, and central laundry facility. The property offers 111 studio units, 93 one-bedroom units, with an overall average unit size of 402 square feet. The units feature refrigerators, air-conditioning, and over-sized closets. The property was recently renovated with new exterior paint, pool furniture, landscaping, irrigation, and improvement of a select number of units. A 238-unit apartment community in northwest Fresno has sold for more than $20.4 million. That comes out to $85,966 per unit — or just under $89 a square foot — making The Enclave apartments sale the highest per-unit price paid so far this year for any multi-family building in the Valley, according to Fresno’s Mogharebi Group, which brokered the sale to a private investment group out of the San Diego area. The brokers didn’t identify the buyers. The apartments, at 3274 W. Ashlan Ave., were built in 1978 and sit on 18.2 acres. The recently remodeled two-bedroom units range in size from 965 to 988 square feet. The complex includes two pools and spas, a business center, a fitness center, a basketball court, a tennis court, a playground, two laundry facilities and a dog park. ORANGE COUNTY, CA—The Mogharebi Group has sold two two-story multifamily assets built before the 1990s for high per-square-foot prices after garnering multiple offers. The properties comprise the Heights, a 30-unit complex at 704-706 West First Ave. in La Habra, and the Minnie Street Apartments, a 20-unit complex at 1426 and 1430 South Minnie St. in Santa Ana. Mike Marcu, SVP of TMG, tells GlobeSt.com that the older buildings that attract the most investor interest are often in gentrifying neighborhoods. “The rental upside in these locations, created by shifts in the tenant base, is attractive to investors looking to add value by repositioning properties.” Marcu adds that in areas that are not yet seeing gentrification, older buildings offer the best buying metrics, which can be particularly attractive to investors looking for increased yield. In August, the firm’s founder and president Alex Mogharebi told GlobeSt.com that Orange County’s urban core has been undergoing a renaissance. “Anaheim and Santa Ana have historically been considered the heart of Orange County. However, over the years, they have been surpassed by newer suburban communities with modern amenities.” He said that recently, a combination of both private and public investments has increased residential demand from young professionals, which in turn has increased investment demand. Built in 1987, the Heights sold for $7.6 million, which equates to $251,833 per unit or $311 per square foot. The Minnie Street Apartments, built in 1961, sold for $3.7 million, which equates to $182,600 per unit or $256 per square foot. The buyers were private investment groups based in the South Bay and the San Gabriel Valley, respectively. The Heights, which was recently upgraded, was sold by a private-equity real estate firm located in the San Gabriel Valley, while Minnie Street Apartments was sold by a private investor located in Orange County. “Due to its age, unit mix, and high parking ratio, the Heights was a highly sought-after asset,” said Marcu in a prepared statement. He added that the offers for this property were “far beyond seller expectations.” Also, Marcu pointed out that Minnie Street Apartments is an older core Orange County asset for which the owner was looking to reposition equity and increase returns. Marcu represented both sides of the transaction for the Heights and the seller for Minnie Street Apartments. THE MOGHAREBI GROUP has been retained as the exclusive listing agent for the largest privately-owned multifamily portfolio that has been available in the UC Santa Barbara market in years. BAKERSFIELD, CA—Autumn Glen and Serena Vista, comprising a total of 250 units, were the last two Bakersfield properties in the Bascom Group portfolio. Both assets sold this summer for a combined price of about $25 million, representing 96% of the asking price and below replacement cost. Mark Bonas, who recently joined The Mogharebi Group as senior vice president, represented the Bascom Group in the disposition of all six of the total Bakersfield assets. After the sale was finalized, Otto Ozen, executive vice president at The Mogharebi Group, offered added insight into the Central Valley market in this exclusive. GlobeSt.com: What do investors look for in a Central Valley investment? Ozen: Within the Central Valley, investors are looking for yields and leverage that are unavailable in core California markets. They are looking to get maximum leverage, with agency loans that are near 75% to 80% loan-to-value ratio. With high leverage, double digit cash-on-cash returns are common. Investors are attracted to properties with amenities that are uncommon elsewhere like washer/dryers in the units and large average unit sizes with townhome floor plans. They prefer premier locations within the Valley that act as metropolitan centers or are near the Bay Area or Southern California. These markets include Modesto, Fresno, Bakersfield and Visalia. GlobeSt.com: Which areas of the Central Valley are most attractive for near-term investment? Ozen: Visalia, Tulare and Hanford are particularly attractive investment markets. Each city features historical downtown areas and has a desirable retail mix that continues to improve. A major driver of interest in the area is the Kings–Tulare regional station, which will serve as a regional hub for the California high-speed rail system, and will be located at a site that is in between Hanford and Visalia. The new rail system is expected to be a boon for the Central Valley because it will reduce the commute into the Bay Area to a realistic level, thus increasing demand for housing from higher income residents. Hanford has been receiving additional interest as Faraday Future has leased the old Pirelli factory to manufacture electric cars there. The new factory is being renovated, with significant work planned in 2018. When complete, it is expected to employ up to 1,300 workers and build up to 10,000 cars per year. Modesto, Merced and Stockton are also attractive markets due to the proximity to the Bay Area, which is pushing commuters further out due to pricing pressures. Bakersfield is attracting investors as renters are being priced out of Los Angeles. GlobeSt.com: What recent developments have you seen taking place in the Central Valley that might affect real estate markets? Ozen: The Central Valley is experiencing a surge of interest from buyers looking for yields that are better than those that are available in the core markets in the Bay Area and Southern California. Starting in Q2 2017, we observed a significant spike in monthly sales volume that dwarfs the previous record for the same period that was set in 2015. We believe this increase is attributable to buyer and seller expectations that appear to be more aligned than they are in core markets. Investors appear to have discovered more compelling investment fundamentals in the Central Valley than are currently available in the Bay Area and Southern California. MORENO VALLEY, CA—The Mogharebi Group, (“TMG”) has completed the sale of Baywood Villas, a 56-unit community, that is located on Bay Avenue. The property sold with multiple offers for a sales price of $10,700,000 that equates to $191,071 per unit or $196 per square foot. The buyer was a private investment group based in Northern California. Alex Mogharebi and Otto Ozen of TMG represented the seller, a real estate development firm located in the Inland Empire. Built on a 3.57-acre site in 2007, the property is located at 22945 Bay Ave in Moreno Valley. Baywood Villas features lavishly outfitted units. Amenities include refrigerator, dishwasher, gas range/oven, granite counter top, premium kitchen cabinet, full-size washers/dryer, built-in microwaves, nine-foot ceiling, mirrored closet, central air-conditioning/heating, built-in wall desks, tiled kitchen/bathroom flooring, double paned windows, and patios/balconies. The community features exquisite common area amenities including two resort-style swimming pools, a hot tub, a barbecue area, a clubhouse, a business center, a gym, an on-site leasing office, and a gated access. COSTA MESA, CA—Anaheim and Santa Ana have historically been considered the heart of Orange County, but have been surpassed by newer suburban communities with modern amenities—but that’s all changing now, the Mogharebi Group’s founder and president Alex Mogharebi tells GlobeSt.com. The firm reports that there has been roughly $6 billion in redevelopment in Anaheim recently, and the Santa Ana is urbanizing so much that it is planning to add a streetcar system to its infrastructure. We spoke with Mogharebi about the renaissance of Orange County’s metropolitan core and where he sees it heading. from a real estate perspective? Mogharebi: Anaheim and Santa Ana have historically been considered the heart of Orange County. However, over the years, they have been surpassed by newer suburban communities with modern amenities. Recently, a combination of both private and public investments has increased residential demand from young professionals, which in turn has increased investment demand. Orange County’s urban core is undergoing a renaissance. There are several significant developments that are under construction or planned within Anaheim: Disneyland’s $1.5-billion addition of Star Wars Land, a $200-million expansion at the Anaheim Convention Center, approximately 1,000 luxury-hotel rooms planned near Disneyland for a total cost of about $2 billion, and a $2.4-billion pedestrian-oriented development that is planned for the Platinum Triangle. Additionally, Santa Ana has benefitted from an improved retail mix in its Downtown, which is an increasingly desirable area due to its comparably affordable housing and great proximity to jobs. Within the Mogharebi Group platform, we have observed significant interest in central Orange County. We have recently marketed and sold the 116-unit ECHO in Anaheim and the 84-unit Tustin View in Santa Ana. Each of these properties received almost a dozen offers and sold for nearly 97% of list price. The winning bidder for each property was an exchange buyer who was willing to step up in price to purchase a desirable property at these burgeoning locations. TMG is currently marketing the 84-unit BLOC Apartments in Anaheim near Disneyland and the 55-unit Vista Royale and 20-unit Minnie Street apartments that are both located near Downtown Santa Ana. GlobeSt.com: How do you see this submarket evolving over the next few years? and creative jobs. As this trend progresses, we anticipate the affordability gap between Orange County and the Bay Area to decline. GlobeSt.com: What infrastructure changes are occurring here that could influence real estate? Mogharebi: Santa Ana has plans for the OC Streetcar that will service the city’s historic Downtown by 2020. This investment will enhance mobility and increase pedestrian-oriented development. It will help shape Downtown Santa Ana into a premier destination for entertainment, shopping, and dining. California’s high-speed rail is scheduled to start passenger service from Anaheim to Los Angeles in 2029. It is expected that Orange County will gain almost 23,000 jobs by 2030 because of the high-speed rail. GlobeSt.com: What else should our readers know about this submarket? Mogharebi: Orange County is a land- and supply-constrained market with properties that are currently undervalued when compared to the tech-heavy markets nationally. Due to the combination of Orange County’s desirable climate, well-educated workforce and less traffic congestion, it is a relative bargain with superior upside in comparison to the Bay Area or even nearby Los Angeles. LANCASTER, CA—The Mogharebi Group, (“TMG”) has completed the sale of the Racquet Club Apartments, a 200-unit community, that is located on 15th Street West. The property sold with multiple offers for a sales price of $21,000,000 that equates to $105,000 per unit or $116 per square foot. The buyer was a private investment group based in Los Angeles, CA. Alex Mogharebi and Otto Ozen of TMG represented the seller, a private equity real estate firm located in Santa Monica and the Los Angeles based private buyer. Built on a 9.65-acre site in 1973, the property is located at 44045 North 15th Street West in Lancaster. The community features exquisite common area amenities including two large resort-style swimming pools and hot tubs, two tennis courts, 24-hour state-of-the-art fitness center, business center with computers and printers, secured access, and reserved covered parking. Central Valley, CA—The Mogharebi Group, (“TMG”) has completed the sale of a portfolio comprising 450-units in 3-complexes that are located throughout the Central Valley. Kings Pointe, a 104-unit community, is located on Harold Street in Kingsburg. Oak Valley, a 109-unit property, is located on East Cross Avenue in Tulare. Oak View, a 237-unit complex, is located on West Caldwell Avenue in Visalia. The portfolio sold with multiple offers at above list price for a total sales price of $46.8 million. Alex Mogharebi and Otto Ozen of TMG represented the seller, a San Diego based private investor. The buyer was a Central Valley based private investment group. Built on a 4.44-acre site in 1987, Kings Pointe is located at 901 Harold Street in Kingsburg. While Oak Valley is situated on a 7.06-acre site at 2001 East Cross Avenue in Tulare, Oak View is located at 4700 West Caldwell Avenue on a 16.46-acre site in Visalia. All three properties are near to significant employment. The properties feature attractive community amenities, including sparkling swimming pool and hot tub, 24-hour state-of-the-art fitness center, and reserved covered parking. Built on a 4.33-acre site in 1989, The Commons is located at 1600 Standiford Avenue, while Summerview is situated on a 5.03-acre site on Coffee Road. They both have significant exposure on their fronting roads, with over 35,000 and 20,000 cars per day, respectively. The properties feature attractive community amenities, including a sparkling swimming pool and hot tub, 24-hour state-of-the-art fitness center, and reserved covered parking. Both complexes are located within two miles from Highway-99, shopping / jobs at Vintage Faire Mall, Kaiser Permanente Medical Center, and Central Valley Plaza. The Mogharebi Group, (“TMG”) has completed the sale of Tustin View Apartments, an 84-unit community that is located on Ponderosa Street in Santa Ana, CA. The property sold April 12 for $22,375,000 with multiple offers. Alex Mogharebi of TMG represented the seller, a Los Angeles-based private investor. The buyer was a private investor in exchange based in Northern California. Built on a 2.83-acre site in 1968, the property is located at 2010 Ponderosa Street in Santa Ana. The neighborhood is north of Interstate-5 in Santa Ana in close proximity to Tustin. It is served by Tustin School District. Tustin View is near to numerous neighborhood retailers including Shabu Shabu Bar, Chipotle, Claim Jumper, Tutto Fresco, and Zov’s Bistro. It is a short drive to Disneyland, CHOC, Westfield Main Place Mall, Orange County Civic Center, and the Outlets at Orange. Tustin View Apartments features attractive community amenities including a large sparkling outdoor pool with a resort-like cabana, barbecue areas, two 24-hour laundry centers, state-of-the-art fitness center, reserved covered parking, and controlled access. The Mogharebi Group (TMG) completed the sale of Country Club Apartments, a 79-unit community located at 160 East Parkdale Ave. in San Bernardino, CA. The property, built on a 5.44-acre site in 1986, sold for $9.6 million. Mogharebi and Otto Ozen represented the seller, an unnamed Orange County based private equity group, as well as the the buyer, an undisclosed Los Angeles based syndicator. INDIO, CA — Indio is one of the most populous cities in the Coachella Valley, and there is an increasing amount of activity in the area because of growing festival activity, the Mogharebi Group’s president Alex Mogharebi tells GlobeSt.com. The firm recently completed the sale of Mountain View Cottages, a 311unit apartment community located on Arabia St. here, on behalf of the buyer, a Simi Valleybased private investor. The property sold with multiple offers for $15.5 million. We spoke with Mogharebi about the Indio multifamily market and what tenants and investors in this market seek. GlobeSt.com: How would you characterize the Indio multifamily market? housing, senior housing, affordable housing and shortterm rentals (for snowbirds). There is increasing amount of activity in the area because of growing festival activity. There is also a secular growth trend in the area fueled by the aging Baby-Boomer population that finds Indio attractive due to its relative affordability and its warm weather. GlobeSt.com: Who are the typical multifamily tenants there, and what are they seeking in an apartment? Mogharebi: Workforce tenants comprise the largest portion of the market. They are employed mostly in the retail, education, construction and leisure sectors. These tenants like a functional design and a large unit size that can accommodate a family at a reasonable price. Unit amenities such as washer/dryer and multiple bathrooms and common-area amenities such as a swimming pool and fitness gym are in demand as well. Seniors are typically retired and have their primary residence here, while short-term rental tenants or live within three hours of the area and have second homes here. They like discretionary finishes such as granite countertops, while a large unit size is less important. GlobeSt.com: What does the investment market there look like? Mogharebi: Recently, Indio has been a strong investment market due to increased demand from the growing number of festivals here that include the Coachella Music Festival, Stagecoach and Desert Trip (the newest addition). These events attract more than 12 million visitors annually, who generate more than $4 billion per year and employ more than 19,000 people here. Due to the aging Baby-Boomer population, there is also the secular growth trend in senior housing. These new demand drivers represent a shift from the old normal, where Indio was a slow-growth market that attracted investors seeking higher yields. It now represents a solid growth opportunity in addition to providing value. GlobeSt.com: What else should our readers know about the Indio multifamily market? Mogharebi: Despite the increased investment demand, Indio still offers investors an opportunity to acquire properties at a lower price on a pound-for-pound basis and still receive higher yields than are available in the primary markets to the west. There are approximately 25 million people within a 2.5-hour drive of Indio, making it a convenient getaway and retirement area. Thus, Indio’s long-term growth rate is stronger than average due to the expected growth in retirees and vacationers. INDIO, Calif. (BUSINESS WIRE) The Mogharebi Group (“TMG”) has completed the sale of Mountain View Cottages, a 311-unit community that is located on Arabia Street in Indio, CA. The property sold with multiple offers for a sales price of $15.5 million. The buyer was a Simi Valley based private investor. Alex Mogharebi and Otto Ozen of TMG represented the seller, a private investment group based in the San Gabriel Valley, and the Simi Valley based buyer. Built on a 12.42-acre site in 1965, Mountain View Cottages is located at 46289 & 46299 Arabia Street in Indio. The community is near to the Indio Fairgrounds and the Larson Justice Center. It is minutes to the Empire Polo Club which is the site of renowned festivals including Coachella, Desert Trip, and Stagecoach. Mountain View Cottages offers the finest in common area amenities. There is a sparkling swimming pool and a fun playground that is surrounded by a tropical landscape and beautiful mountain views. All the units are bungalow style, meaning that residents don’t share a wall with other units. Historically workforce oriented, the North County San Diego submarket of Vista has been transitioning to young professionals, the Mogharebi Group’s founder and principal Alex Mogharebi tells GlobeSt.com. The firm recently represented seller Pacific Development Partners LLC in the sale of Mesa Garden, a 124-unit apartment complex here, for $24.2 million to a private investment group based in San Diego. The sale price was 97% of list price. We spoke exclusively with Mogharebi about the Vista multifamily market and how it’s changing as North County becomes more popular for investors. GlobeSt.com: How would you characterize the multifamily investment market in Vista? Mogharebi: The Vista investment market is in transition. The Vista submarket is historically workforce oriented. Recently, the area has been transitioning to young professionals. GlobeSt.com: Are there any new multifamily developments or exciting redevelopments happening in this market? Mogharebi: In North County, there are several large projects that are presently under construction and total more than 1,000 units. To me, the most exciting properties in the market are the redevelopment opportunities that exist in older product in North County. These properties are exciting because they provide an opportunity to create value while remaining competitive against newer developments that command top-of-the-market pricing. GlobeSt.com: What elements of this submarket are drawing in investors? Mogharebi: Comparative affordability, improving retail mix and job growth are major drivers of new investment in this market. Another significant driver that is underway is improving infrastructure that will reduce commute time and increased connectivity to surrounding areas. GlobeSt.com: What else should our readers know about the multifamily market in Vista? Mogharebi: The SR-76 expansion is under construction and is going to improve drive times into surrounding areas, which will open up new jobs to local residents. Steady gains in the US economy have resulted in net positives for the multifamily sector-will this wave continue for the foreseeable future? What’s driving development and capital flows? Join us at RealShare Apartments on October 19 & 20 for impactful information from the leaders in the National multifamily space. Learn more. International Village, a UC Riverside-area apartment complex, has been sold to a private group based in the San Gabriel Valley. The Mogharebi Group completed the sale. In a release, the company said the property sold for $20 million -about $217,000 per unit. The company says the property is on a ground lease from the university through 2049, making it exempt from property taxes. The 124-unit Mesa Garden apartment complex in Vista, CA, has sold to a locally based private investor for $24.2M, or $195k/unit. The complex at 800 East Bobier Drive is near the intersection of Vista Way and close to state Highway 76, I-78 and I-5; Mira Costa College; TriCity Medical Center; and The Triangle and Vista Village shopping centers, as well as a short drive to the Pacific Ocean. “Northern San Diego County has been slow to recover, but has recently become one of the hottest submarkets in Southern California,” says The Mogharebi Group president Alex Mogharebi. He, along with TMG VP Otto Ozen, repped the seller, Pacific Development Partners. Alex says rents are soaring along the I-78 Corridor due to being near employment, strong local job growth and comparative affordability. He says the complex had multiple offers and sold at 98% of asking price. The complex was partially renovated in 2015, and with the completion of renovations and the project’s high-end amenities, Alex says it will command rents competitive with new product. Amenities include a pool, a spa, a sauna, a clubhouse, a billiard room, a fitness center, and basketball and tennis courts. Units feature plush carpeting or wood flooring, ceiling fans, dishwasher-disposals and refrigerators, and renovation is adding washer/dryer hookups in two-bedroom units. The Mogharebi Group, has completed the sale of Mesa Garden, a 124-unit apartment complex. The $24.2 million sales price equates to $195,000 per unit. The buyer was a private investment group124-unit apartment complex built in 1977, brought $195,000 per unit. Northern San Diego County has been slow to recover but has recently become one of the hottest submarkets in Southern California, says Alex Mogharebi, president ofTMG. Mogharebi and Otto Ozen of TMG represented the seller, Pacific Development Partners. The Mogharebi Group also procured multiple offers and ultimately, the buyer at 97% of list price. Built on more than seven acres in 1977 and partially renovated in 2015, the property is located at 800 East Bobier Drive in Vista near east Vista Way. In close proximity to Highways-76 and -78, Interstates-5 and -15, Mira Costa College, the TriCity Medical Center, The Triangle and Vista Village shopping centers, and the Pacific Ocean. Community amenities at Mesa Garden include a sparkling swimming pool, soothing spa, rejuvenating sauna, club house, billiard room, fitness center, full basketball court, and tennis court. Each unit features plush carpeting or wood flooring, ceiling fan, dishwasher / disposal, and refrigerator. Washer / dryer hookups can be renovated in the two bedroom units. The Mogharebi Group (TMG) has completed the sale of Mesa Garden, a 124‐unit apartment complex, for $24.2 million. According to CoStar Group and public data, the buyer was Pine Vista Apartment Homes LLC, an affiliate of The Apartment Co. of Encinitas. Alex Mogharebi and Otto Ozen of TMG represented the seller, Pacific Development Partners, LLC. Built on over seven acres in 1977 and partially renovated in 2015, the property is located at 800 E. Bobier Drive in Vista. Focusing on wealth creation for the client regardless of the type of transaction that will accomplish it is the thrust of the Mogharebi Group, a newly formed joint venture between Alex Mogharebi and Cohen Financial. As GlobeSt.com recently reported, Mogharebi says “in other firms, the brokerage and lending sides of the business tend to arm-wrestle as to which one ‘wins the transaction’ with a client,” whereby his firm aims to “eliminate that conflict and let the market decide the best solution, whether selling or refinancing a property.” We spoke exclusively with Mogharebi and Cohen Financial’s president of capital markets Manny Brown about the new venture and why its premise makes sense. Alex Mogharebi, a commercial real estate broker, has opened The Mogharebi Group in Costa Mesa’s South Coast Metro area to provide multifamily investment sales and financing services. Alex Mogharebi, one of the leading commercial real estate (CRE) brokers in the U.S., has opened own new firm. The Mogharebi Group which opened this week, will offer a unique platform of multifamily investment sales, financing and advisory services, Mogharebi says. According to Mogharebi, a key market differentiation for the new firm is its ability to provide investment sales and/or the right lending products to affect the correct strategy for the client and execute the transaction that maximizes the client’s returns. While some firms offer both capabilities, The Mogharebi Group has a unique approach to determining whether selling or refinancing a property ideally serves the client’s best interest: In the final analysis the market will determine the best option. To form a seamless process between sales and lending, The Mogharebi Group has created a joint venture with Cohen Financial and its parent company Pillar. Cohen Financial is one of the nation’s leading originators of commercial and multifamily real estate financing. Pillar is one of the nation’s leading direct lenders of multifamily real estate and one of the few lenders in the country that offer Fannie Mae, Freddie Mac and Federal Housing Administration HUD loans alongside traditional life insurance company portfolio, CMBS conduit, and bridge loans under one roof. Through this venture, The Mogharebi Group brings direct lending products, expertise, and a unique business model focused on serving the full spectrum of multifamily investors’ needs. Prior to forming the group, Mogharebi was ranked No. 1 nationwide for 17 years at Marcus & Millichap and Berkadia, closing in excess of 50,000 units with total sales approaching $5 billion. Cohen Financial is a diversified, commercial real estate capital services firm offering debt and equity placement, loan administration and advisory services. A new investment banking entity sailed into Newport Beach this week, and it’s sure to send ripple effects across the Southern California investment real estate waters. After more than 17 years as a top national broker, including stints at Marcus & Millichap and Berkadia, Alex Mogharebi has formed The Mogharebi Group, a multifamily investment sales, advisory and lending firm. The Mogharebi Group claims it’s distinctive because, through its joint venture with Cohen Financial, it eliminates the normal conflict between teams, and allows the market to determine whether the best strategy is to refinance or sell. Alex Mogharebi, one of the leading commercial real estate (CRE) brokers in the U.S., opened his new firm, The Mogharebi Group, today to offer a revolutionary platform of multifamily investment sales, financing and advisory services. According to Mogharebi, a key market differentiator for the new firm is its ability to provide investment sales and/or the right lending products to effectuate the correct strategy for the client and execute the transaction that maximizes the client’s returns. While some firms offer both capabilities, The Mogharebi Group has a unique approach to determining whether selling or refinancing a property ideally serves the client’s best interest: In the final analysis the market will determine the best option. Founded by Alex Mogharebi, one of the leading commercial real estate brokers in the U.S. and a leading expert on the multifamily sector in Southern California. Prior to forming The Mogharebi Group, Alex was ranked No. 1 nationwide for 17 years at Marcus Millichap and Berkadia, closing in excess of 50,000 units and total sales approaching $5 billion. The Mogharebi team brings together a group of professionals with world-class expertise, aligned culturally and economically, to pursue the best interests of its investors. The team offers a one-of-a-kind approach to real estate investing, acting as a broker as well as delegated underwriter and loan servicer to offer direct‑lending options for its clients. To learn more about the firm, visit www.mogharebi.com. Cohen Financial is a diversified, commercial real estate capital services firm offering debt and equity placement, loan administration and advisory services. Cohen Financial is well recognized as one of the nation’s leading loan servicers and special servicers, as well as an originator of commercial and multifamily real estate financing. Known for finding innovative solutions to meet client needs, the company maintains an Equity Practice to help borrowers complete their capital needs and an enhanced Capital Advisory and Valuation Services to assist financial institutions and investors to better evaluate assets and investment opportunities. Alex Mogharebi is the VP of investments with Marcus & Millichap’s Ontario, Calif., office. He joined the firm in 1989 and has since sold over 40,000 multi-family units totaling over $3 billion in sales. He is a member of the company’s Institutional Services Group and has been the number one Investment Associate nationwide 13 times. CREF: How did you get into the real estate business? AM: I was in mergers and acquisitions before I got into real estate. Real estate was a big part of the business and made up a significant portion of the transactions. When I got into real estate back in 1989, I saw a significant need to provide the same kind of professional services that were only accessible by large firms. I wanted to provide a similar type of advisory services to clients by bringing Wall Street to Main Street. CREF: What notable deals have you been involved with? AM: I successfully marketed and closed on a $142 million portfolio of eight properties with over 1,100 units in the Inland Empire. A sophisticated developer/builder client of ours had decided to dispose a portion of their portfolio. We marketed the portfolio just before the start of the holiday season and were able to generate high interest with over 40 offers in just a few weeks. Our challenge was to simultaneously manage and close all eight transactions with eight different buyers within a short window of time in order to accommodate our clients’ exchange goals. We ultimately closed the sales on all at a higher value than what our client initially expected. CREF: In what commercial real estate industry do you specialize? AM: I specialize in multi-family residential. Why? I’m a big believer in specialization. Real estate is a daily business and no single broker can be an expert in the different arenas of commercial real estate. By having in-depth knowledge of the product type as well as the market that we operate in, we can provide the type of information that allows apartment owners to make informed decisions. CREF: How has the industry changed since you’ve been involved? AM: I believe we have clearly moved from a transaction-oriented to a relationship-driven industry. I’ve assembled a team of experts that focus on a specific segment of the business to provide the high quality advisory services that nurtures and cultivates our relationships with clients. CREF: How does the market look over the next 12 months? AM: It looks like we will soon be in a recession. Residential construction is taking a hit not seen in decades and this has a significant multiplier effect on the rest of the economy. Job growth and incomes will be restrained which in turn will limit rent growth. The global liquidity crises and the ensuing tighter lending requirements have impacted pricing and resulted in an upward trend in capitalization rates for multi-family investments which is expected to continue well through 2008. Wall Street Journal named Alex Mogharebi as the Top Investment Broker of Marcus & Millichap’s Ontario, CA office in 2008. Wall Street Journal named Alex Mogharebi as the Top Investment Broker of Marcus & Millichap’s Ontario, CA office in 2007. Wall Street Journal named Alex Mogharebi as the Top Investment Broker of Marcus & Millichap’s Ontario, CA office in 2006. Wall Street Journal named Alex Mogharebi as the Top Investment Broker of Marcus & Millichap’s Ontario, CA office in 2005. Wall Street Journal named Alex Mogharebi as the Top Investment Broker of Marcus & Millichap’s Ontario, CA office in 2004. Wall Street Journal named Alex Mogharebi as the Top Investment Broker of Marcus & Millichap’s Ontario, CA office in 2003. Wall Street Journal named Alex Mogharebi as the Top Investment Broker of Marcus & Millichap’s Ontario, CA office in 2002. Wall Street Journal named Alex Mogharebi as the Top Investment Broker of Marcus & Millichap’s Ontario, CA office in 2001. Wall Street Journal named Alex Mogharebi as the Top Investment Broker of Marcus & Millichap’s Ontario, CA office in 2000. Wall Street Journal named Alex Mogharebi as the Top Investment Broker of Marcus & Millichap’s Ontario, CA office in 1999. Wall Street Journal named Alex Mogharebi as the Top Investment Broker of Marcus & Millichap’s Ontario, CA office in 1998. Wall Street Journal named Alex Mogharebi as the Top Investment Broker of Marcus & Millichap’s Ontario, CA office in 1997. Wall Street Journal named Alex Mogharebi as the Top Investment Broker of Marcus & Millichap’s Ontario, CA office in 1996. Ten Inland Empire real estate brokerages participated in our inaugural survey for determining the Top Performers in six commercial real estate sales categories. Alex Mogharebi of Marcus and Millichap in Ontario topped the list for investment specialists, posting $81.2 million in sales on 32 transactions. Mogharebi also topped the list for total sales dollar volume in 1995. Mark McAdams of Cushman & Wakefield in Ontario also appears at the top of two lists, office landlord representation and combined office representation. We had to add the latter category to our original list since some representatives had difficulty segregating their sales in retrospect. The consensus among the list toppers is that the commercial real estate market should be firming up this year and recovering well in 1997. Our thanks to those offices that participated, and our congratulations to the Inland Empire Business Journal Top Performers in commercial real estate sales for 1995! Alex Mogharebi has a well-­deserved reputation as an agent who can move investment properties, especially apartment complexes. Unfortunately, Mogharebi didn’t reach his goal of $100 million in sales, but he tops the list as investment representative – and the list for overall dollar sales volume as well-based on 32 transactions. His keys for success are simple and succinct: “Keep a promise, undersell and over deliver.” Mogharebi said that means: do what you say you’re going to do; let clients make the decisions; but give them more information and representation than they expect so that they can make a well-informed decision. Mogharebi has been active in real estate since 1978 and became involved with investment property sales in July, 1989, when he moved to a desk at Marcus & Millichap. He works 11 hour days Monday through Friday, and puts in two Saturdays per month. Leisure hours are often spent with family playing tennis. Wall Street Journal named Alex Mogharebi as the Top Investment Broker of Marcus & Millichap’s Ontario, CA office in 1995. Wall Street Journal named Alex Mogharebi as the Top Investment Broker of Marcus & Millichap’s Ontario, CA office in 1994. Wall Street Journal named Alex Mogharebi as the Top Investment Broker of Marcus & Millichap’s Ontario, CA office in 1993. Wall Street Journal named Alex Mogharebi as the Top Investment Broker of Marcus & Millichap’s Ontario, CA office in 1992. Wall Street Journal named Alex Mogharebi as the Top Investment Broker of Marcus & Millichap’s Ontario, CA office in 1991. Wall Street Journal named Alex Mogharebi as the Top Investment Broker of Marcus & Millichap’s Ontario, CA office in 1990.